Chicago — Potter & Potter Auctions is pleased to announce its 600+ lot Gambling Memorabilia sale to be held on Saturday, March 30th, 2019 starting at 10am at the company's gallery, located at 3759 N. Ravenswood Ave., Chicago, IL 60613. The sale features the collection of Tom Blue, an avid enthusiast with a keen eye for the extraordinary. Blue assembled one of the most comprehensive and finely curated gambling collections in the United States over the course of several decades. All lots from this upcoming event will be on display and available for public preview on Wednesday, March 27th, Thursday, March 28th, and Friday, March 29th from 10:00am to 5:00pm in the Potter & Potter facility. All times noted are CST. Outstanding antique books and publications on poker, playing cards, cheating, and advantage play represent many of the top lots in this auction. Collectors are certain to discover many titles of interest among the 300+ selections on offer. 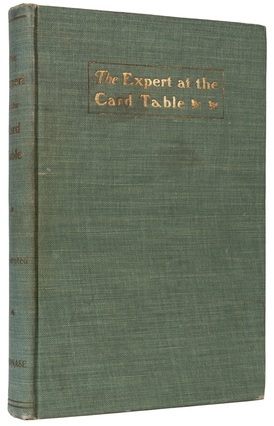 Lot #35, a first edition of SW Erdnase's The Expert at the Card Table is estimated at $6,000-9,000. This tightly bound, clean, and crisp example is illustrated with over 100 drawings “from life” by Marshall D. Smith. According to Gabe Fajuri, President of Potter & Potter Auctions, "This is unquestionably the single most mythologized book related to gambling, cheating, and card sharping ever produced, since its initial publication in 1902 by the mysterious author "Erdnase," this treatise on the "science and art of manipulating cards" has never been out of print." Lot #151, FR Ritter's Combined Treatise on Advantage Card Playing and Draw Poker from 1905 is estimated at $6,000-9,000. This absolute rarity is heavily illustrated with halftones showing blot-out, shade, line, scroll, and other marked cards, hold-outs (including the first-known published photograph of a Jacob’s Ladder-style sleeve hold-out), false cuts, and deals. In May, 2016 Potter & Potter sold another copy of this legacy book for $12,000. Lot #39, a first edition of Gerritt Evans' How Gamblers Win from 1865 is estimated at $4,000-6,000. This exceeding rare first edition is one of the earliest American works to describe the techniques of crooked gamblers, and perhaps the first to focus heavily on cheating in poker. It is one of a mere handful of copies known, two of which are institutional holdings. And bidders are likely to look favorably upon lot #219, Abraham De Moivre's The Doctrine of Chances: or, a Method of Calculating the Probabilities of Events in Play. This first edition from 1718 is a landmark work in the theory of probability, with many of the concepts illustrated with and applied to gambling with cards and dice. De Moivre dedicated this work to his close friend, Isaac Newton. Breathtaking selections of gambling accessories and devices are also well represented in this sale, with nearly two dozen temptations on offer. Lot #525, a 23" tall, c. 1910 American made gaffed mahogany keno goose is estimated at $2,000-3,000. This handsomely turned example features a hidden internal compartment that holds a second set of keno balls. High or low numbers can be dispensed depending upon the desired outcome of the game. Lot #604, a c. 1931 Mills 10 cent front slot machine is estimated at $1,00-1,500. This 14k example is in working condition and includes its original gold award tokens. Lot #529, a c. 1900 boxed mechanical Jeu de Course horserace game is estimated at $400-600. This professionally restored rarity is decorated with imitation French Francs, a flag ornament, and a metal horse head on its box top lid. And its case closed with lot #530, a c. 1940 All-In-One-Game housed in its original handled chest. Roulette, Market, Put & Take, Poker, Chuck-a-Luck, Horse Races, Bunco, and Faro are just some of the games that can be played on this versatile, tin lithographed device. It is estimated at $250-350. This auction's ephemera, poster, and print selections are a royal flush. Headlining this category just might be lot #577, five mid-20th century gambling-themed photographs of actors and actresses. Estimated at $100-150, the celebrities included in this collection include Barbara Stanwyck, Bob Hope, Ronald Coleman, Vilma Banky, and Salvatore Baccaloni. Lot #566, David Klein's 1960s-era Las Vegas Fly TWA travel poster is estimated at $500-700. This fabulously rendered, linen backed example comes to life with a playing card queen enjoying a glass of champagne with images of Las Vegas life inside her robes. And lot #76, a collection of gambling ephemera spanning the 1890s-1940s timeframe, is estimated at $150-250. It includes advertisements for playing cards, games on paper, pamphlets on gaming, excerpts from magazines, advertisements for stores, and others. Rolling along, this sale offers nearly 50 lots of dice and related apparatus. Lot #470, a pair of gaffed leather “butterfly” dice cups made by Bill Gusias around 1970 is estimated at $1,200-1,800. This as new duo consists of one straight cup and one gaffed with a secret compartment; the performer switches from one to the other by pressing on a sweet spot on the bottom of one of the cups and twisting. Lot #443, an American made 19th century loaded dice jig is estimated at $1,000-$1,500. This device was used by crooked gamblers to drill into a die and add lead to weight the desired side. This jig was obtained by the consignor from the famed Old West gambling collection of Bill Williamson and was the actual example used to illustrate the cheating section of “The Gamblers” in Time-Life’s Old West series (1978), p. 131. And its hip to be square with lot #459, a collection of 248 mid-twentieth century crooked dice. The grouping, estimated $800-1,200, includes 23 weights, 166 tops and bottoms, 20 flats, and 39 matching fairs, all housed in a leatherette case. This sale also has the upper hand in the playing card category. Lot #448, an all original c. 1880 Will & Finck brass sleeve holdout is estimated at $4,000-6,000. This fine, early Jacob’s Ladder-style holdout delivers a card into the gambler’s hand when his elbow is bent, and retracts when his arm is straightened. This actual example was used to illustrate the cheating section of “The Gamblers” in Time-Life’s Old West series (1978), p. 124. Potter & Potter sold a similar Will & Finck brass sleeve holdout in May, 2018 for $12,000. Lot #335, a complete set of Jazaniah H. Ford “Lafayette” playing cards from c. 1824 is estimated at $3,000-5,000. This deck commemorated the 1824 return of Marquis de Lafayette to the United States. He was invited by President James Monroe in part to celebrate the upcoming fiftieth anniversary of our nation’s founding. Ford was the first Boston-area manufacturer of playing cards, and the first to issue a deck commemorating American history. And lot #334, a deck of Grover Cleveland campaign playing cards from 1888 is estimated at $2,000-3,000. This presidential caliber rarity, the only one extant, depicts Cleveland as King, running mate Allen Thurman as Jack, and First Lady Frances Folsom Cleveland Preston as Queen. The nearly three dozen lots of antique poker chips and sets round out this comprehensive gambling sale. Lot #448, a late 19th century White Mansion mother of pearl gambling chip set from Paris is estimated at $800-1,200. The chips include 60 dark blue plastic $25 chips, 60 aqua plastic $50 chips, 60 rectangular red plastic $100 chips, 28 rectangular mother of pearl $500 chips, and 28 oval mother of pearl $1,000 chips. The plastic chips are engraved “M.W." while the mother of pearl ones are engraved “White Mansion.” Lot #493, a late 19th century German royal flush gaming set is estimated at $500-700. This collection includes 450 enameled brass chips in lavender, blue, white, and yellow encased in a handsome, dark wooden box with wooden storage pegs. And the chips will fall where they may with lot #494, c. 1900 American made royal poker set, estimated at $300-500. The set features its original wooden box and lock, 51 brass $10 chips, 99 nickel $5 chips, 47 copper $25 chips and a complete 1920s U.S. Playing Card Co. art deco “Butterfly” deck signed by artist Mollie Macmillan. According to Gabe Fajuri, President at Potter & Potter Auctions, "Tom Blue spent a lifetime pursuing books on gambling and associated subjects in a way perhaps no other collector has. His library features all of the classics, alongside the rarities, and many of the works are represented by what I would call "top copies" - superlative condition, signed, or otherwise unusual or fine in some way. Anyone interested in this subject should find something in the auction to make his or her head spin." Image: Lot 35, The Expert at the Card Table. Estimate $6,000-9,000.